Millville, NJ (September 12, 2018) – Rain, rain, go away and never ever, ever come back! 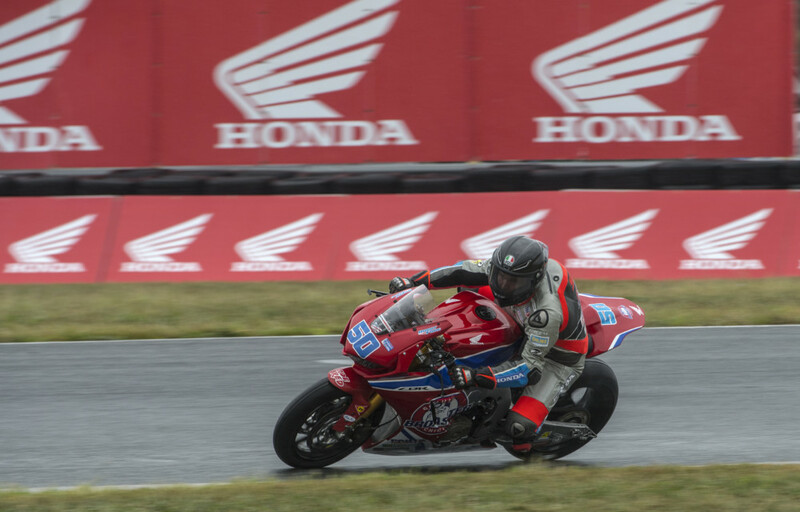 The penultimate round of the MotoAmerica Superbike Series took place this past weekend from what became a very soggy and cold New Jersey Motorsports Park. As chaotic as the weather was, the action on track was even more so. This one weekend was a microcosm of the past nine rounds that packed all the highs and lows of an entire season into one single event. The weekend started off with some of the highest temps and humidity of the year. Set-up day almost took out a few crew members due to heat stroke. That heat was still unrelenting come Friday morning when the crew arrived at the South Jersey Facility to prep for the days qualifying action. However, before anything could ever happen, there was still a lingering electronics issue that was resolved within an hour of QP1. There was an audible sigh of relief from Crew Chief Scott Jensen as Bobby’s bike fired up just before the green flag flew. With both bikes sorted out, Cam and Bobby hit the track under oppressively hot and humid conditions. 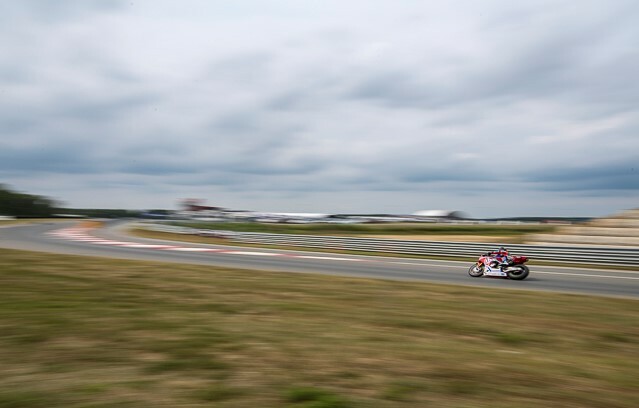 It was clear that both riders had some pace but also had some work to do ahead of the final qualifying session of the weekend later that afternoon. Cam would close QP1 in P9 while Bobby would be in P11. 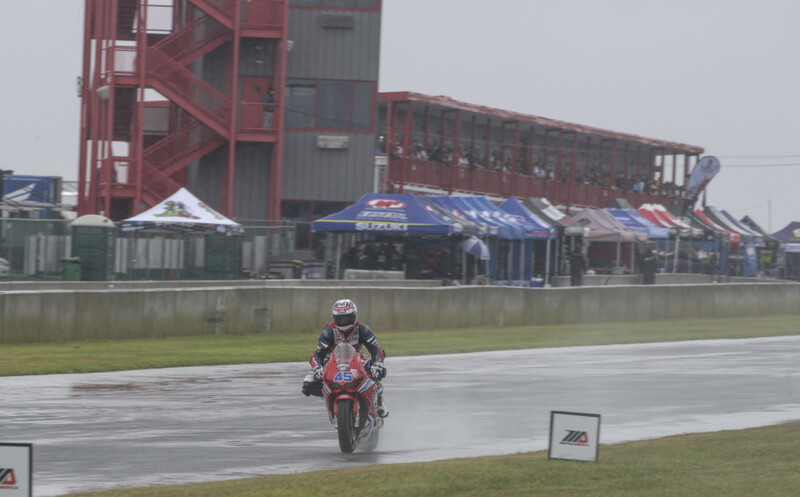 With storms approaching, both crews and riders knew that QP2 would be their last time on a dry and warm track. This was their best chance at setting fast times around the 2.25 mile track. While the session wasn’t an action packed ordeal with riders running race simulations, or stringing multiple fast laps together, the few laps that they would turn were critical. At one point Cam was in the top three and Bobby was firmly in the top five. Granted these were just bragging positions as it would be their overall positions that determined their Superpole participation. With Cam finishing the session in P6 he would secure a Superpole position with P6 overall. Meanwhile, Bobby would be out on his fast lap and discover the limits of tire grip as he would crash out and finish the day in P11. As expected, Saturday brought the rain and an expected temperature drop. These conditions dramatically change the characteristics of not only the bike, but the track as well. The latter being the biggest issue. Superpole would no longer be a nail biting battle of hot laps and chewed tires. It would instead be a 15 minute slog on a full wet set-up. The spoils would go to whomever keeps their bike upright the longest and do so at tamer than normal speeds. 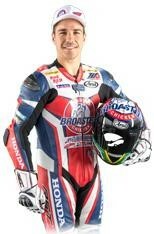 In these conditions, both of the Genuine Broaster Chicken Honda riders were able to circulate at an impressive pace. They finished the session next to each other with Bobby on the second row in P6 while Cam would start the races from the inside of the third row in P7. For Cam, it was more impressive as he crashed during his fast lap, picked the bike up finished the session. This would signify the team’s highest qualifications of the season. As the time drew closer for the start of race one, the weather was not about to improve. 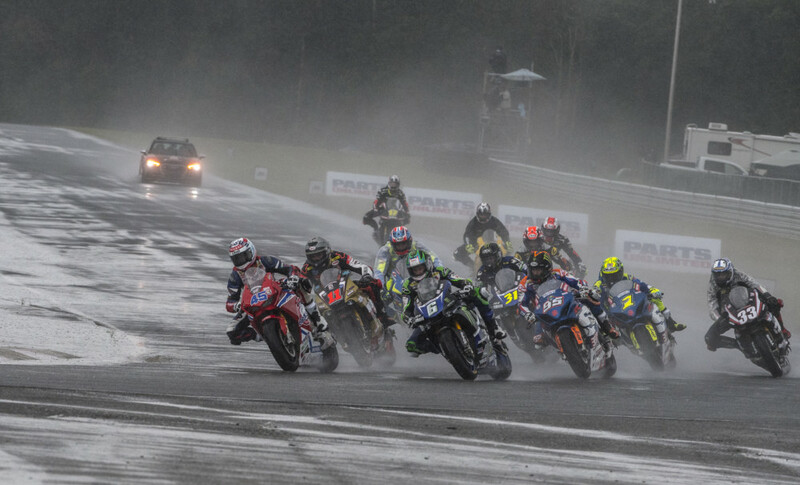 The race would be run with all bikes in a full wet set-up. While the rain wasn’t pouring, it was coming in sheets and it would continue to fluctuate throughout the race. 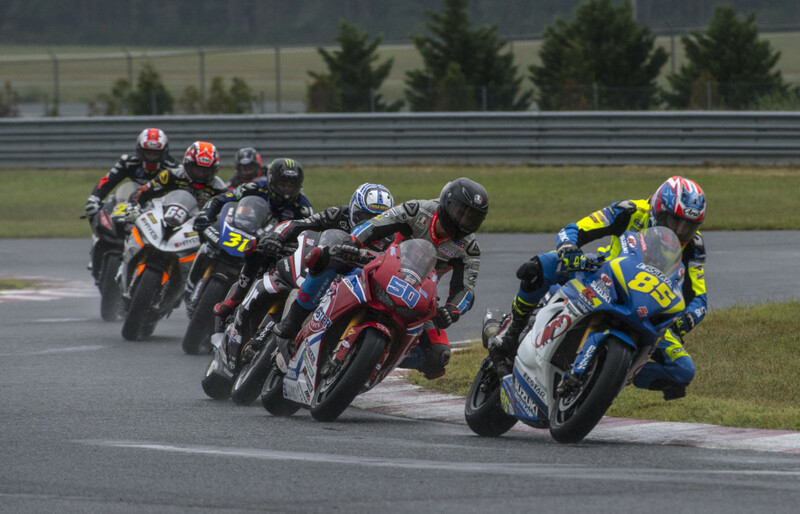 As the riders took their places and filled the grid, the weather was on a holding pattern and the track was soaked. The lights went out and the field of superbikes gingerly investigated the track. 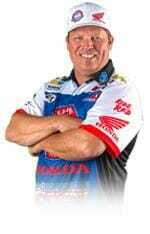 All expect for Josh Herrin, who would make another leap frog start and within a few corners had a gap on the field that he would not relinquish. That left everyone else to battle over the remaining positions. Cam made a great start and was up in the lead group attempting to chase down Josh. Bobby was right on his rear tire by mid race. Recovering from a not-so-great start, Fong would quickly catch up to the lead pack and soon, both big red bikes were together on the circuit. 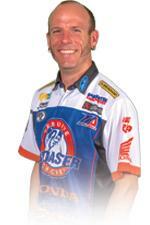 The stage was being set for a possible double top five as Roger Hayden couldn’t shake the duo of Cam and Bobby. However, just passing the mid-point in the race, Bobby would suffer a high-side entering T6. The tricky conditions catching him out and putting an end to his race. This would leave Cam to fly the team flag and fight for the highest position of the season. Fight he did! Cam got past Roger Hayden and was charging hard in fourth place. With one lap to go, Rog would make the pass and knock Cam back into the fifth position. 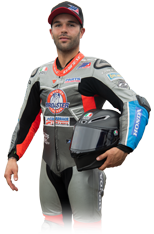 Crossing the line in the midst of a drag race, Cam would claim his first Superbike Top Five! While excited and obviously overjoyed at the result, Cam would state that he was pretty “Bummed” that Roger got him at the end, all the while smiling ear to ear. Sunday morning the team was greeted with even worse weather conditions. Add a strong consistent wind to the rain and ever dropping temperature. A steady rain was mixed with 30-40 mph winds and temps in the high 50’s / low 60’s. This would represent an almost 40 degree temp drop since QP1. First order of business was to go out for a quick morning warmup session. After his incident on Friday, Bobby was evaluated by medical and given the okay to try the warmup session. He and Cam would both take to the track and check conditions. The really low temps with the ever increasing amounts of standing water on the track made for a miserable session. Bobby would come into the pits and state that he wasn’t feeling too well. Cam would follow him in claiming the track was awful but the bike was working well. Bobby would go back to medical and upon a further evaluation he was unfortunately deemed unfit to race. So going into the Race Two, the team would be a rider down. Going solo, Cam would take his starting position for Race Two in conditions that can’t accurately be described; you’d have to experience it to fully appreciate the level of misery. With the wind howling, the rain pelting their backs, the riders waited for the lights to go out. Once they did, Cam was the rider who made the flying start. Before the field entered Turn One, Cam was leading the way. 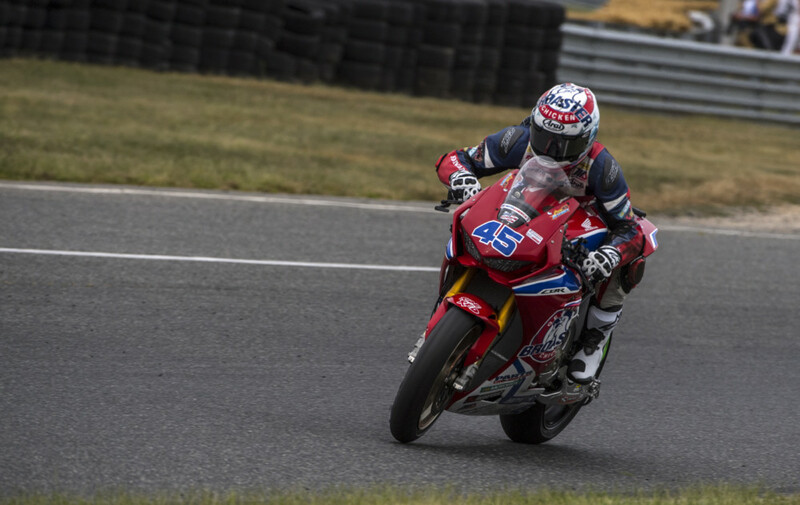 For the first time in a long time, a Honda was leading an American Superbike race. Within a few laps however, Cam would be pulled back into the fold and find himself battling for a podium position. Cam was fighting hard to maintain his position with every ridier taking risks in this heated contest. As the laps were winding down, Cam had a firm lock on 3rd position, just a few seconds behind Roger. Not wanting a repeat of Race One, where Toni caught Cam, he maintained his pace only to get caught out with three laps to go. Crashing out while third is not something a team and rider would be happy about, however, Cam was three laps away from a podium. That’s something to celebrate. After a season of struggles and complications, the Genuine Broaster Chicken Honda was in a position to be on the podium. Showing again that the team and crew are close to where they wanted to be all season. Obviously, Cam and crew were dejected and upset; there are still many positives to take away from the weekend’s performance. 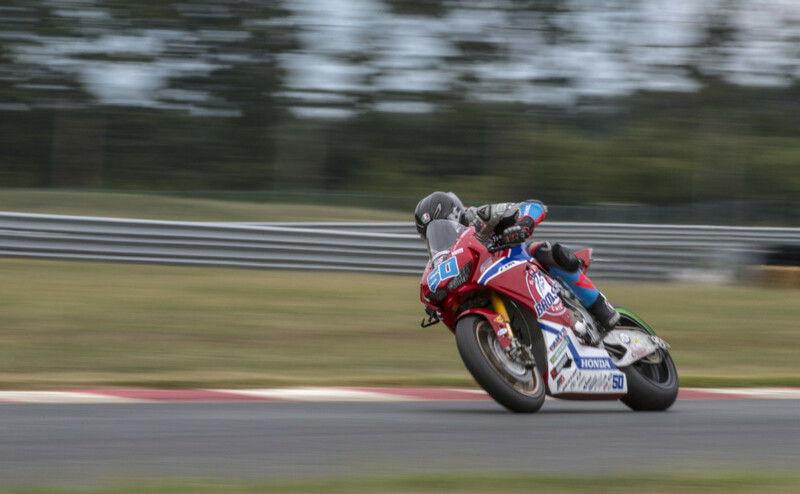 With the championship settled, the team moves onto Barber Motorsports Park for the final round for what is essentially the final opportunity to prove their capabilities. The team is determined to end the season on a high note and head into the off-season with confidence and pride. “New Jersey was one of those weekends with a lot of ups and downs. It was my first weekend back after the little foot injury and It felt like I hadn’t missed anytime on the bike. The boys have done some work on the bike and it is working really well. Super happy with the top five finish in race one but the mistake in race two is going to be on my mind for a while. I was running third and crashed with three laps to go, I’m so gutted for the entire team as they deserved that podium. But I’m not going to dwell on the past, instead I’m going to focus on being strong and fit for the last round of the season. “In my eyes it was an up and down weekend, we learned a lot. More importantly I learned that I can do well in the wet. The biggest disappointment obviously was falling down in the race on Saturday because I felt like I was getting stronger and that I had a good chance of getting a top five finish for the guys. Having to sit out race two was an absolute awful feeling. Now, I’m looking forward to Barber. I’m hoping that it’s dry but if it isn’t, we’ll take what we’ve learned from Pitt and New Jersey; My luck it’ll probably be wet, and apply that to the event. “This was one of those weekends where as a team owner you just want to pull your hair out. The ups and downs of the season were all played out in one weekend. It was crazy! I’m gutted about Bobby and that his high-side during race one took him out of the weekend. It’s important to be 100% out there and after seeing him get off the bike on Sunday morning, I agree with the MotoAmerica Medical Staff. But I’m just super bummed as he was going well and it was great to see him and Cam working together on the track. I know he’ll be back for Alabama to put in a strong final performance. Cam, well, he had the best weekend of his season by far. His qualifying effort was great and he performances in the races were fantastic. With his first top five, he was even more motivated on Sunday. He made an incredible start and it was great to see him running in that podium position, especially in these horrific conditions. It hurts that he crashed out from a podium position, I’m not going to lie about that, but he was doing great and it’s just one of those racing things. 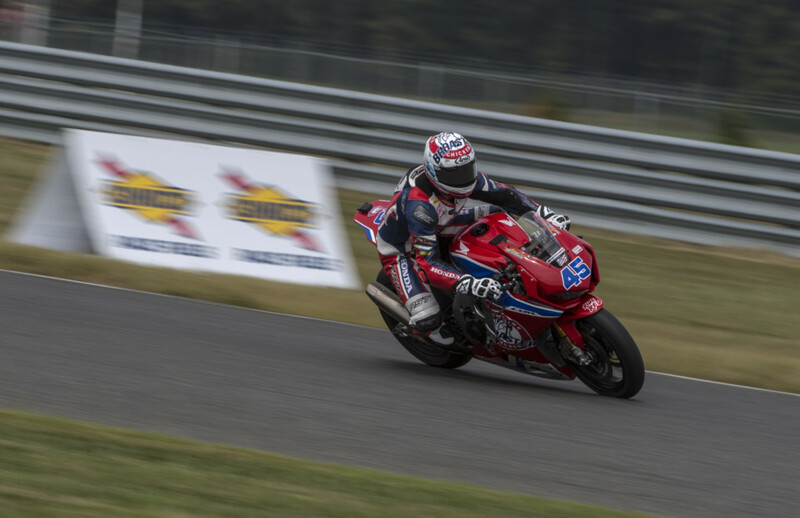 “We came into NJMP with high expectations as Cam was coming back from his injury and Bobby had a strong result at Pitt Race during his first race weekend on the bike. Looking at the weather coming into the event it was apparent that Mother Nature intended to throw curve balls at us all weekend. As it turned out QP1 and QP2 were the only dry sessions of the weekend, Cam and Bobby were only 1.0 and 1.2 seconds off the fastest time in each dry session. As the rains came for Superpole we found ourselves 6th and 7th on the grid, and looking strong for Race 1, unfortunately Bobby had a crash that ruled him out for the remainder of the weekend. Cameron brought home a solid fifth place finish after running fourth for the majority of the race. With Bobby on the sidelines for race two it was Cameron as the lone Honda CBR1000RR Superbike on the grid. With a fantastic start and a good line into turn one Cam found himself leading the race out of turn one. As the laps wound down Cameron was confidently in 3rd place with a large gap to fourth with three laps to go, when Cam had an unfortunate crash in Turn 3 bringing an end to the race three laps too soon.